52 Quilts in 52 Weeks: Winter is Coming -- Knit Faster! Winter is Coming -- Knit Faster! Although meteorologically, it's still Autumn, Zero degrees Fahrenheit sure feels like Winter to me! Yesterday's low of zero, and high of nine degrees, means some colors in my Year in Temperature scarf I haven't used for, well, months! 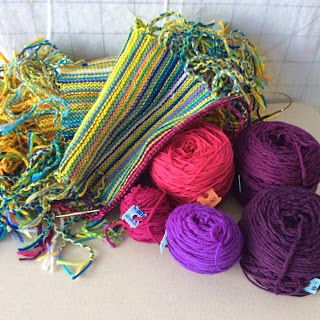 I'm looking forward to unwinding the entire 10 feet of knitting to see how the colors flow through the year's knitting. I'm frantically trying to finish this sweater to send to My Little Sailor for Christmas. Now that he's on a shore billet, I don't have to send everything priority mail. But will the box make it to Japan in time if I don't? I think this Abuelita Worsted in "Mermaid Song" looks like the Navy's camouflage uniform. Some people call that uniform "blueberries." I hope MLS doesn't think this is too "bright!" The Knitting Bee in Portland offered a free hat pattern with the purchase of Rowan Pure Wool Worsted. I picked the grey-brown for a Hats for Sailors hat, and the turquoise for me. Then I realized I had just bought several skeins of this yarn -- same color! -- at Ewe and Me here in Colorado Springs! Pure Wool Worsted is an especially good yarn because it's washable -- needed for Hats for Sailors. Here's the hat pattern -- isn't it a great one? I love how the cables cross at different places on different rows. Now I need to ask a favor. A friend is undergoing chemotherapy, and needs hats to withstand this cold Colorado weather. I found a terrific Chemo Cap pattern that calls for Cascade Fixation. I thought I had several skeins of that yarn, but must have given it away in a fit of "de-stashing." Might one of you have some Fixation that you'd be willing to swap for another yarn? You know with my stash, you could pretty much name your price! If so, please send me a private message and maybe we can work something out. Keep knitting and keep warm! I'm just learning to knit, so I'm pretty slow. I started a scarf, my first project, a couple months ago thinking I would get it done in time before the cold hit. Wrong!! So now I'm all with the 'Knit Faster!!' motto as well!! I cannot wait to see that scarf too!!! FYI: That cabled hat pattern is not free, it's $5 on Ravelry. Can't you use another yarn that is similar instead of the Fixation for the chemo hat? Daryl, posting here also so others can see. The pattern was free WITH purchase of the yarn -- and it's a wonderful yarn! The idea with Fixation for Chemo Caps is that the lycra in the yarn helps keep the hat on bald heads. I have some Fixation I'd be glad to pass along. I'll look in the morning to see what colors/amounts I have. Linda, your comment comes through as a no-reply commenter. Please PM me at Aunt Marti at 52 quilts dot com. The Fixation yarn is $5 per skein at Webs, so let me know what you would like in trade!